Dr. Reason made a presentation in 2006 - http://www.vtt.fi/liitetiedostot/muut/HFS06Reason.pdf - which clearly predates both of these NEA/IAEA Workshops at Chester. Reviewing these slide Jim was evidently previewing his 2008 book "The Human Contribution." I would encourage readers to consider the Reason presentation (or better yet the whole book) as their benchmark for assessment of both the topic of these NEA/IAEA Workshops and their fruit. I suggest that Reason offers an "enterprise world view" where as Taylor conformed his remarks to the "Regulatory Approaches and Methods" institutional boundary established for the Workshops. "Human Factors is about understanding and improving human performance in the workplace - especially in complex systems." In this view, accident avoidance is the product of the same mindful activities that govern meeting the mission objective or recovering from a schedule setback. Production and Protection are two sides of the Performance coin - inextricably related. However like most engineered artifacts Performance unfolds on a dynamic terrain even as its components co-evolve to each others outcomes. Reading the summary of the Workshop and Dr. Taylor's keynote I am struck almost paragraph by paragraph by the perverse influence of certain flawed assumptions about "how organizations think" - particularly the bias, taken from our friends the engineers and technologists, that integrated institutional performance is reducible to "root causes" and admits of concise modeling in the flat-worlds of engineering drawings and text procedures. Put simply, it is not possible to comprehensively model inorganic, co-evolving, intentional Systems of Systems (e.g. the various National Nuclear Energy Enterprises) with Newtonian causal theory. This is not a critiques of modeling per se, rather it is a critique of the institutional mindset - seemingly common to Workshop attendees from NEA/IAEA/NRC/INPO etc. - that modeling is an extension of engineering practice. One good indicator of how pervasive this self-defeating "reductionist" convention is can be seen by looking at the normative lexicon and the key memes that appear to be a desired outcome of participants. "1. 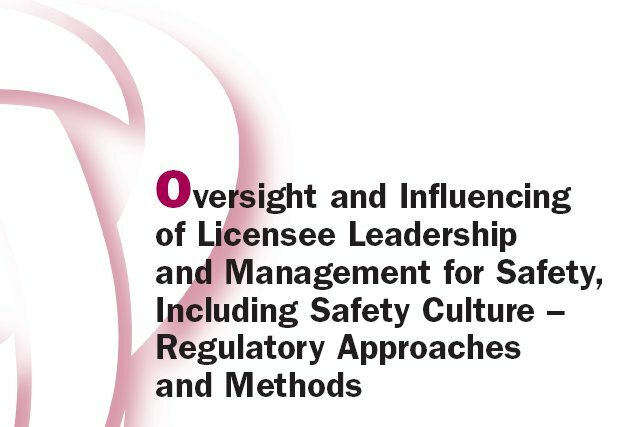 Encourage an agreed definition of safety culture and maintain its currency. "2. Promote regulatory self assessment of LMfS/SC." There is something ontologically muddled about the need for an "agreed definition" followed by an injunction that it needs to be kept "current." The second item is a fatally ambiguous statement "regulatory self assessment" would seem an oxymoron - such muddled notions have no place in an Executive Summary. Those familiar with the multiple authoritative sources on the topic of Nuclear Safety Culture will recognize a lack of consistency in terminology or consensus about the scope and scale of the topic. But that has not precluded, all the Bigs from weighing in with ostensible standards related to the topic. To the best of my knowledge, no writing on the topic represents the product of normative consensus technical standard development including rigorous peer review. Rather these documents have been "crowd-sourced" among gathering of "industry experts" (be they licensee or regulatory workers). There is a rather obvious answer for this seeming discrepancy about authoritative parentage that seems to elude the Reductionists at conference after conference. That would be this fact: "Culture" is normed for research purposes in the non-technical domains of psychology, sociology, anthropology, history, and literature. These are poorly represented in the "expert crowds." In looking through the lists of participants credentials one typically finds only limited participation of non-technical disciplines. Still, the feeling after reading very many of these documents, emerges that there is an enormous - seemingly irresistible - need to "STANDARDIZE this THING." There is a very serious problem with that imperative - the THING under the spotlight is EVOLUTION (more accurately co-evolution in complex intentional Systems of Systems). It hasn't succumbed to reductionist interpretation in 150 years - its not going to fall in place because Nuclear Safety Regulators want it to! Until there is a sensible unified view of the non-linear character of Complex, High-Consequence Enterprises - and a revised (i.e. not fully Reductionist) grasp of regulation as tempering the rate of system change, meetings like this are driving the Noise to Signal ratio in the adverse direction.